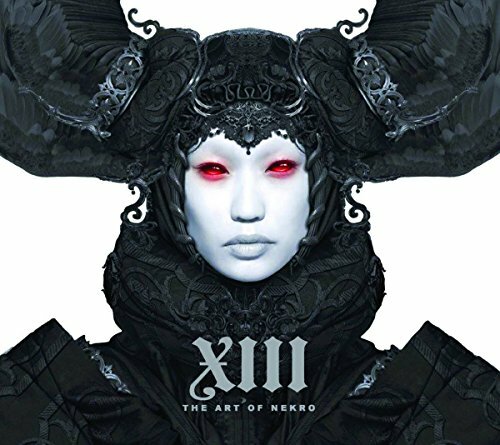 This is a stunning book from illustrator and digital artist Nekro. It's a large format 120-page hardcover with silver trimmed edges. I probably should have researched more into Nekro before I bought this book because it's difficult to tell what's inside just from the cover. I'm lucky because the images inside are just amazing. It reminded me of the first time I saw Kris Kuksi: Divination and Delusion. Both artists have a sense of aesthetics that's so profound. The artworks look like sculptural art to me. Actually they look like a blend of photo, 3D renders, visual effects and colour manipulation. Most pieces involve some characters but the costumes, ornaments or whatever they are wearing are so intricate in design with gothic or steampunk or dark world influence. These are otherworldly fantasy imagery. Most artworks are in grayscale or monochrome with some other colour chosen, usually red or blue, to draw attention. It works well and creates a mysterious mood and atmosphere that's consistent throughout. Most double pages just showcase one piece of work, one that shows you the whole piece while the other page zooms in to show you all the details. This is an artbook with high production values, and the artworks are mesmerising.